Morgan’s first experience with international work came in 2003, when she travelled around the world with Semester at Sea studying intercultural relations. She received her Bachelors degree from Assumption College in Worcester, Mass, and worked as an intern in the probation department in the Worcester Trial Court. Morgan then worked on human resources at a Biotech company. At the time of her fellowship, Morgan was pursuing her Master’s in Social Justice in Intercultural Relations with a concentration in community development at the SIT Graduate Institute in Brattleboro, Vermont. Anyone have any magic connections? Part 2 of Hadiya: Women Unite! 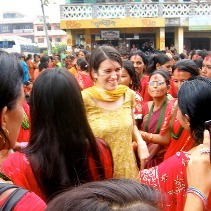 I just arrived back in Gaighat after two days away in the city of Biratnagar. Morgan is off to Nepal!